QI’m 21. I suffer from hair fall. How can I stop it? AHair loss as your aware can be a very stressful thing, therefore I have listed as many things as possible to help slow this down and stop any more unnecessary hair from falling out but please DO NOT PANIC. It is normal for both men and women to lose between 50-100 hairs per day, if you wash your hair every other day then expect to see up to 200 hairs in your bath and so on. However not all of my points listed bellow will be relevant to you, but some most certainly will. You must eat a well balanced diet, as nutritional deficiencies, eating disorders or even excessive amounts of certain vitamins, such as A & E (which some people over indulge taking too many vitamins) can also cause hair loss. Hair follicles are made of protein. Therefore, it is advisable to eat a diet rich in protein. Include protein-rich food such as low-fat cheese, eggs, almond, beans sprouts, fish, seafood and yogurt in your diet. Soy milk and tofu are smart additions to the diet, as they are enriched with protein. Calcium is another important nutrient for strengthening the hair follicles and roots in your scalp, therefore try to include food rich in calcium in your diet. You must take care of your health as chronic illness, high fevers and infections can all contribute to hair loss, although this can be reversed once your health is back again. If your hair is long try to avoid tight ponytails or cornrows which will stretch and pull at your hair. Avoid from colouring your hair more than once every six weeks. 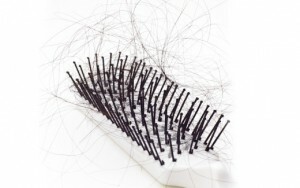 Overuse of hairdryers and curling irons can aggravate the problem of hair loss, leading to baldness. Try not to use these products on a regular basis if you are facing the problem of excessive loss of hair. Sleep is an important factor, try not to compromise with 7 hours of sleep, irregular sleeping pattern is one of the leading causes for hair loss. Hair care products should be chosen carefully, because they would directly affect the growth of your hair. Never use harsh shampoos, conditioners or stylizing products, because they would have a negative effect on the growth of your hair. If you are not sure which the correct products are then I would ask for professional help from a reputable hair salon. This would be very beneficial to you because the stylist would take time and go through their range of shampoos, conditions and styling products. Try to use hair care products that have organic ingredients, like the herbal ones. Since such products contain less harsh chemicals, they are often suggested to people suffering from the problem of hair loss. Alcohol and tobacco are the root causes for majority of hair loss problems. so quit habits such as smoking and consumption of alcohol. Certain medications can also lead to hair loss. Therefore, consult your physician in case any medicine causes the heavy loss of hair. Stress is a major factor, I understand that we all have a certain amount of this, but try to limit this as much as possible, as this may lead to all different problems including hair loss. If you have tried most of the points detailed above and you still continue to lose your hair and also start seeing the first signs of baldness, then it maybe hereditary hair lose, with this in mind, there is one more thing you can try, although you will need to check with your doctor or Trichologist first. The product is called Propecia, (women cannot use this product) it increases hair growth on the scalp and prevents further hair loss in men. Men with mild to moderate but not complete hair loss, can benefit from using Propecia. On average your hair grows about 1 centimetre (half an inch) each month. Hair grows from hair follicles, which are located under your skin. A single scalp hair grows continuously for 2-4 years (growth phase) and then stops growing for 2-4 months (rest phase). After this your hair falls out. In its place a new healthy hair begins to grow, and the cycle is repeated. The hair on your scalp are always in different stages of this cycle so it’s normal to lose scalp hair every day.